Electric street transport is equated with clean, breathable city air, something that opinion polls have constantly shown almost everyone wants. The gentle whine of the electric motor is seen as a 'forward looking' friendly sound - unlike the 'roar' of the internal combustion engine. Electric Buses are looked at on two pages.. These topics are on this page. Electricity From Geothermal Power Stations Really IS The Cleanest & Safest Option! Electric Buses Are Environmentally Sound! Parked Vehicles Blocking The Road? No Problem! The Need For Trolleybuses In Britain. The Case For Not Using Fossil Fuels Instead Of Electricity. The Case For Not Using LPG and CNG. The Case For Not Using Biodiesel (Includes How One UK Town Experienced Fuel-Source Deception). Hydrogen / Fuel Cell Buses. Fossil Fuel Powered Hybrid Buses. These topics are on the other page. Capacitor (Capabus) and Flywheel Energy Storage. Improved hill climbing capabilities (especially trolleybuses). Better overall performance and less vibration (none whilst idling!) which results in a faster, more comfortable, smoother and hence more attractive journey experience for passengers. For bus operators faster journeys reduces the fleet size & the number of trolleybus drivers required to operate the route - producing a notable bottom line improvement - whilst less vibration results a longer vehicle life. Lower and more predictable operating costs - compared to the 'volatile' price and availability of imported fossil and other liquid fuels - even moreso when exchange rate issues are taken into account. Fewer moving parts and the 'slide out / slot in' modularity of the electric traction packages which makes for simpler and cheaper maintenance. Experience gained from railway electrification which has shown that the sparks effect does attract more patronage, even if low road speed limits and traffic conditions mean that the actual journey times are only slightly improved. Lower overall lifetime costs - although the initial investment in vehicles and infrastructure (if needed) will make electric buses appear to be a more expensive option than simply buying a few more motorbuses. With trolleybuses the presence of the infrastructure both acts as a continuous advertisement for the system and helps instill confidence that the transport will be here today - and tomorrow(! ), thereby encouraging businesses to make investments in the served corridors. With battery electric buses recharging the vehicles during off-peak hours (typically overnight) eliminates any issue of capacity for electrical generation. Electric Buses Are P o p u l a r With The Passengers! 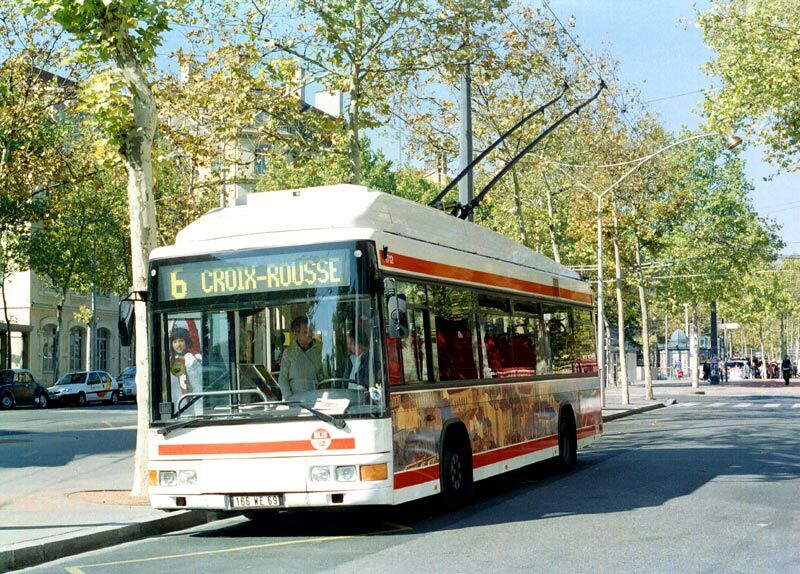 The space age designed 'Cristalis' trolleybuses in Lyon, France. 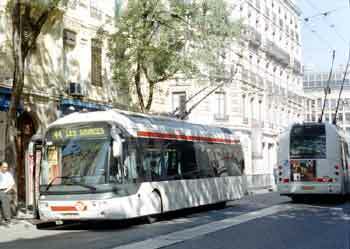 Trolleybus Rapid Transit routes in Lyon. Proof Of Their Popularity Comes From Experience In The Towns & Cities Which Use Them! Salzburg, Austria takes air pollution issues seriously and as part of a plan for total elimination of fossil fuel powered buses from its streets has converted more diesel bus routes to its already extensive trolleybus system. commons.wikimedia.org/wiki/File:12-11-02-bus-am-bahnhof-salzburg-by-RalfR-22.jpg In Arnhem, Holland they found that a service which is busy enough to justify a bus every 10 minutes - six buses an hour - is cheaper to operate with trolleybuses than motorbuses. The San Francisco passenger survey found that while the streetcars are the overwhelming 1st choice - even for routes where they are not a viable proposition - the electric buses are considerably more popular than the motorbuses, which are actively disliked, being rated as noisy and smelly. 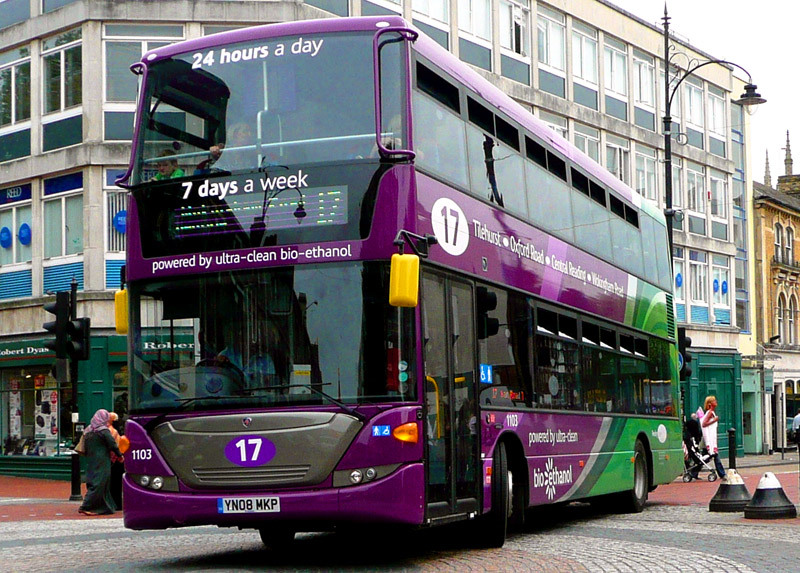 Indeed when roadworks caused temporary motorbus substitution of some electric bus services (with service frequencies and journey times remaining unchanged) there was an 11.33% downturn in passenger patronage that can only be explained by passengers making a pro-active choice to avoid the motorbuses. 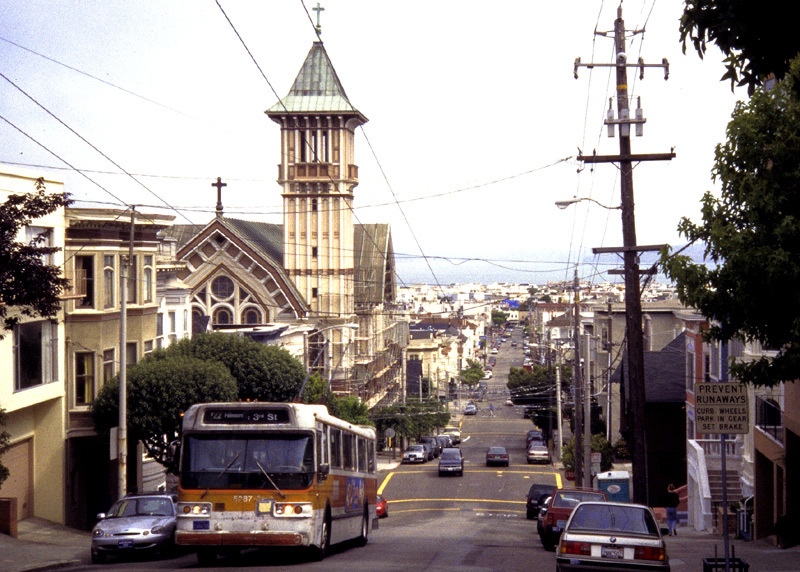 San Francisco, USA - passengers like their electric street transports (modern streetcars, historic streetcars and trolleycoaches) - and given a choice pro-actively avoid motorbuses, which they see as being noisy and smelly. In an ideal world the electricity would be sourced from renewable sources (wave / geothermal / hydro, etc) as then the electric street transports would be truly 100% non-polluting and help humankind to follow policies for sustainable development. Wind power is also already used, in a few places, although many people would suggest that experience has shown it to be too fickle to be relied upon and is perhaps more suited to domestic micro-generation. Solar power also has many benefits, especially for lighter duty applications such as office lighting, with excess energy harvested during the hours of daylight being fed into the national grid. Wave power is perhaps best suited to coastal communities. The renewable clean energy source which with present-day technologies would probably be the most reliable is geothermal, as it will work at all times, irrespective of whether the weather is windy or calm, daylight or after nightfall, the sea is calm or rough. Geothermal energy does not add to air pollution! Once the facilities have been constructed the cost of the energy should remain the same over many decades. Critics often allege that by sourcing electricity from fossil fuels all that is really happening is that the pollution is being shifted up the energy chain to the power station. However, following extensive research in the University of California it has been found that even with low grade coal that produces a lot of carbon dioxide (as is used in Germany) electric traction offers an almost complete elimination of carbon monoxide and hydrocarbons, resulting in a significant global air quality benefit. Of course if the fuel used is high grade coal or natural gas (or another so called 'cleaner' fossil fuel) the benefits are even more admirable. Experience in Sweden has shown that when a type of coal-burning power station known as 'pressurised fluidised-bed' is used then the emission of sulphur oxides and nitrogen oxides are also considerably reduced; furthermore, when these facilities are linked in with combined heat and power facilities (ie: provides both electricity and hot water which can be made available to industrial and domestic consumers alike) then they are about 40% more efficient than their traditional large coal burning equivalents (ie: 75% efficient opposed to 35% efficient) and are so clean that they can be located within cities. In some areas natural gas is used to create electricity. Typically this is less polluting than coal. Sometimes gas is sourced by a method known as fracking. There is growing evidence that this destabilises the ground, damages local water tables, contaminates drinking water and has other undesirable local geophysical effects. In addition, this is very short-termist, whilst at the present time it may be financially profitable it leaves the children of today a damaged, polluted landscape for their tomorrow. Many countries source electricity using nuclear power, although what happened because of the melt-down of several of the Fukushima reactors in Japan has alarmed so many previously unaware and disinterested people that there are now many people who are opposed to more nuclear power stations. Nuclear power generation also leaves much radioactive waste material which could be described as an obnoxious, poisonous gift that this generation is bequeathing upon the next generation. It is understood that whilst it is possible to process and reprocess nuclear waste until it is actually safe, and gain much extra electrical energy whilst doing so, there is a rarely-spoken reason why the people in power do not permit this to be done. This could be military and be connected with nuclear weaponry. Some people advocate Thorium as a safer alternative to uranium, some even suggest that as with what is known as cold-fusion there are powerful people in established very wealthy fossil-fuel industries who stand to lose too much to allow any true alternative (that is not already being used) to be commercialised; it is beyond the scope of this page to say any more on this topic. 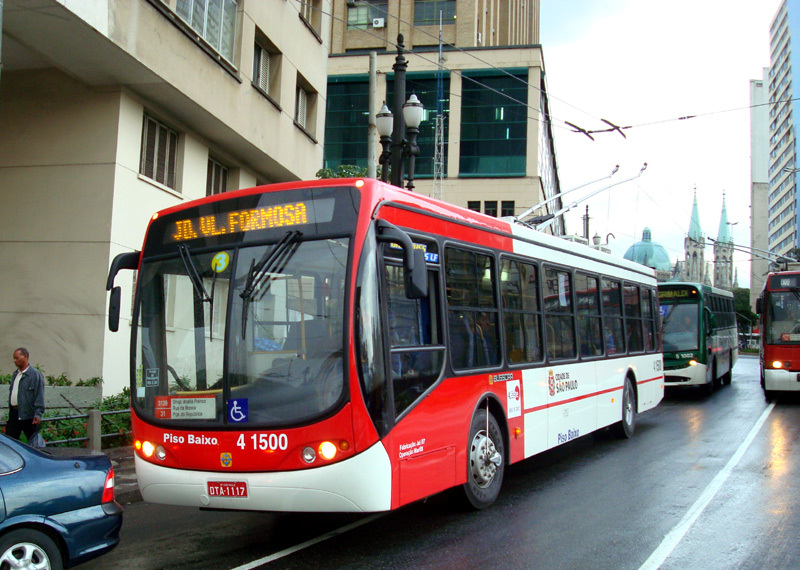 Modern rigid (ie: not-articulated) trolleybus in São Paulo, Brazil. Image & license: Rafael-CDHT / Wikipedia encyclopædi. Public Domain. commons.wikimedia.org/wiki/File:Trolleybus_Low_Floor_4_1500_-_Sao_Paulo,_Brazil.JPG Trolleybuses come in many different vehicle lengths - including triple axle 15 metre rigid variants, as seen here on demonstration in Salzburg, Austria. Image courtesy of Bruce Lake. The environmental case for electric traction is that even with so-called 'cleaner' (but still finite) fossil fuels (eg: LPG, CNG, etc.,) the only proven viable vehicle propulsion system that will not pollute the air that we breathe in our towns and cities comes from electricity. Whilst renewable liquid fuels are available (gasohol, bio-diesel, etc.,) they still pollute their local environments so are more suited to quieter rural routes where air quality issues are less severe and economics suggests that electrification would simply not be a viable proposition. pedestrian zone in Neuchâtel, Switzerland. A video showing a seriously (air) polluted bus + taxi pedestrian zone in London plus this clean air equivalent scene from Geneva has been placed on the ‘YouTube’ film / video website and can be watched (in a new window) by clicking either the projector icon or the link below. So, Knowing The Benefits, Why Aren't More Cities Investing In Electric Traction? 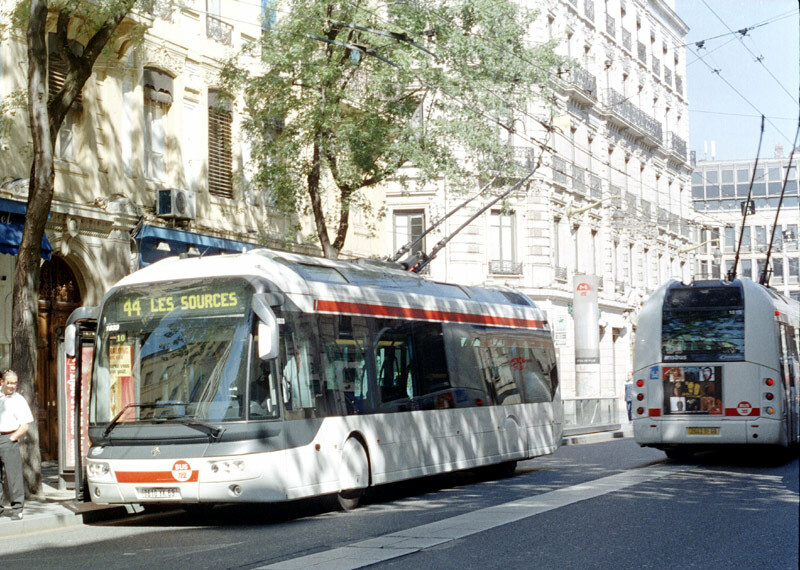 Perhaps the primary reason why more cities are not investing in electric traction is that the continuing limitations of battery technology means that the only way to obtain sufficient electrical energy for a full days' work is by making that energy available wherever the vehicle happens to be, and the only proven viable way to achieve this (and maintain safety within the street environment!) is through the installation of an overhead wire power supply system. It is unfortunate but every community has its negatively orientated NIMBY (not in my back yard) type of people and it seems that a few of them dislike these overhead wires. Oddly enough though, these people are hardly ever heard complaining about the clean, breathable city air that electric traction brings! 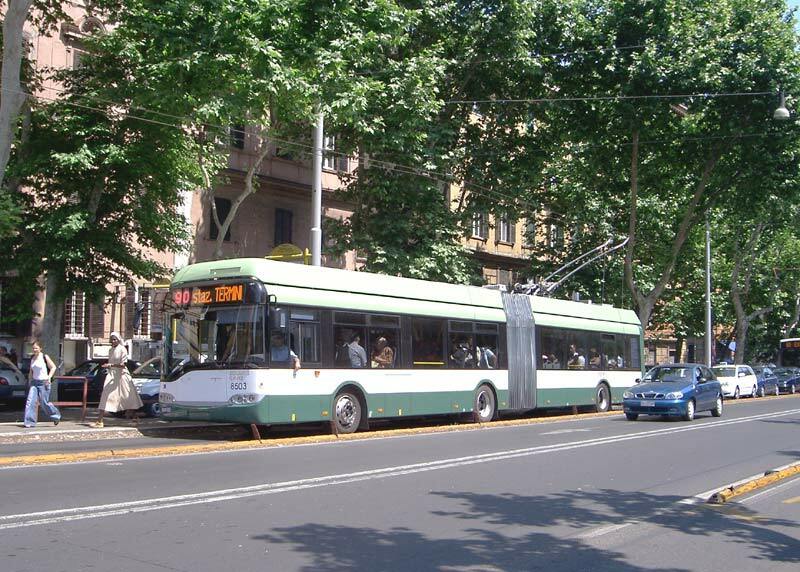 As part of a policy for cleaner urban air, and having investigated all the alternatives and the financial benefits from reduced healthcare costs, in March 2005 the Italian capital city of Rome opened its fist trolleybus route since 1972. These vehicles also feature powerful batteries giving them an expected 10km off-wire range. The reason for this is that within Rome city centre there is a 3km unwired section and in an effort to maintain urban air quality the use of diesel (or other fossil fuel) power systems was felt to be undesirable. The extra long range of the batteries is also to ensure that they have the endurance to cope with traffic delays in stop start (rush hour) travel conditions and to guarantee power to the brake compressor & air conditioning. Battery mode operation will usually include 5-15 minutes laying over between journeys at the central bus terminus in Rome city centre - during which time the buses remain in battery electric mode. Recharging takes place whilst running under the wires. In January 2008 Rome announced the creation of a 60 vehicle trolleybus system serving another part of the city. However, with experience showing that battery operation represents an Achilles heel so the next batch of 45 trolleybuses will include super-capacitors (for onboard energy regeneration) and Euro 5 reduced pollution auxiliary diesel engines for the unwired areas. Unfortunately whilst by summer 2013 work had started on this project and the new trolleybuses had all been built and placed into store, there have been delays in installing the overhead wiring infrastructure. Media reports cite two reasons for the delay, these being related to questions of irregularity related to the project's finances and an archaeological survey. The Tangenti Filobus (trolleybus bribes) financial scandal has also involved the construction of metro line C and has become so wide-ranging that it makes front page headline news as well as the subject of television programmes and several court cases. The dozens of arrests include a former Mayor of Rome and Mafia boss who was nick-named "one-eye" after he lost an eye in a shoot-out! Over 100 other people have been placed under investigation as well as several political parties, and more... It is likely that one or more people will end up being jailed. In the event, the first overhead wiring was installed in August 2014. 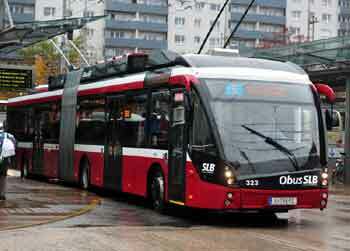 Alas but by October 2014 the batteries on all but four of the 30 trolleybuses which began service in 2005 had become life-expired and needed replacing, at a cost of €30,000 each vehicle! Media reports suggest that the batteries had been inadequately maintained and could not cope with the intensive demand placed upon them by the lengthy and busy unwired section in the city centre. As a result most of the fleet is out of service. What would have helped prevent this situation is if short sections of overhead wiring had been installed at the city centre terminus, as this would have allowed a partial recharge of the batteries plus the full use of air-conditioning / heating whilst connected to the mains supply. 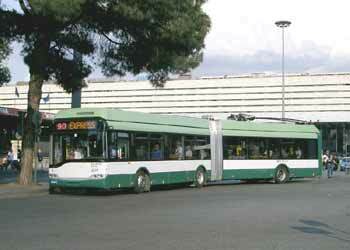 Rome trolleybus operating in battery mode just after leaving its stand at the "Termini" bus station in the city centre. Rome trolleybus in overhead wire mode travels along a segregated Bus Rapid Transit lane in Via Nomentana. Surely Buses Should Be As Clean As Trams?! Trams (streetcars) are almost always electrically powered - indeed this feature is often touted as one of their major benefits - and there really is no reason why buses should not be equally city (and town!) friendly. It really is most strange that so many transport 'experts' (& environmental advocates / lobby groups etc) have such double-standards with respect to air quality (or lack of) and bus / tram propulsion systems. As yet none of the proposed tram systems for Britain have been advertised as using diesel powered trams, yet (almost) all the proposed British bus-based rapid transit schemes feature diesel (or other fossil fuel) powered buses. Whilst it is true that motor buses are not the only vehicles which create tail-pipe pollution (cars, lorries, motorcycles and taxis do too) bus derived air pollution is the easiest to solve. This is because buses generally follow fixed routes along comparatively few of the roads in a cities' overall street network. Effectively this means that significant air quality gains can be achieved by equipping just a few roads for trolleybuses. 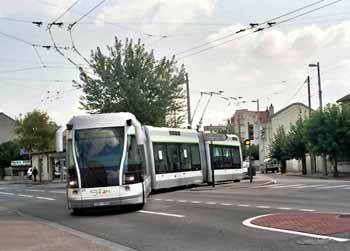 Whilst modern trams (streetcars) usually collect their power from a single overhead wire via a pantograph fitted to the vehicles' roof (with electrical return being via the running rails) electric buses will use a pair of overhead wires (one each for power & return) and twin 'trolley' poles fitted to their roofs. This explains why they are called "trolleybuses". In North America they also use other terms, such as trolleycoaches; etb's / electric trolley buses (to distinguish them from diesel-powered 'trolley' buses that look like an old fashioned "trolley-car" as is often used in the leisure industry) & trackless trolleys - "trolley" is another American term for "tram" or "streetcar" so a trackless trolley is a "trolley car" that collects power from overhead wires using "trolley poles" but travels without rails. Although there are upfront investment costs associated with new trolleybus networks - and because they tend to be built in small batches the vehicles themselves are more expensive to purchase - experience has shown that once operational trolleybuses can be cost competitive with diesels if you take a "lifetime" view of an installation (20 years or so) and factor in their expected longer life, lower maintenance costs, increased availability, increased attractiveness to passengers (higher revenues), better energy efficiency, etc. 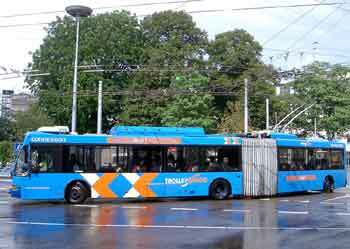 In Arnhem (Holland) the management of the trolleybus system have quoted about six vehicles per hour (10 minute headways) as about the break even point when it becomes more economic to operate a service with trolleybuses than diesels. High capacity three-section double-articulated LighTram trolleybuses (as seen here) were designed for busy trolleybus routes where their 30% higher passenger capacity than single-articulated trolleybuses offers an alternative to converting the services to (steel wheel) trams. and Zürich below - the latter image comes from Wikipedia. 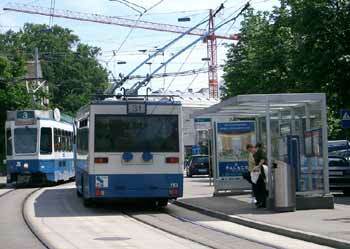 Similar vehicles are also used in the Swiss cities of Lucerne (Lüzern) & St Gallen. 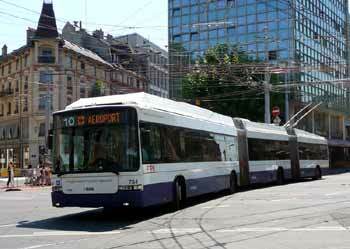 As of Spring 2007 Geneva decided that to both cater for the increasing numbers of passengers travelling and reduce urban air pollution it will convert its busiest trolleybus routes to tram - and then use the displaced trolleybuses and LighTrams to both lengthen existing trolleybus routes and electrify more motorbus services. 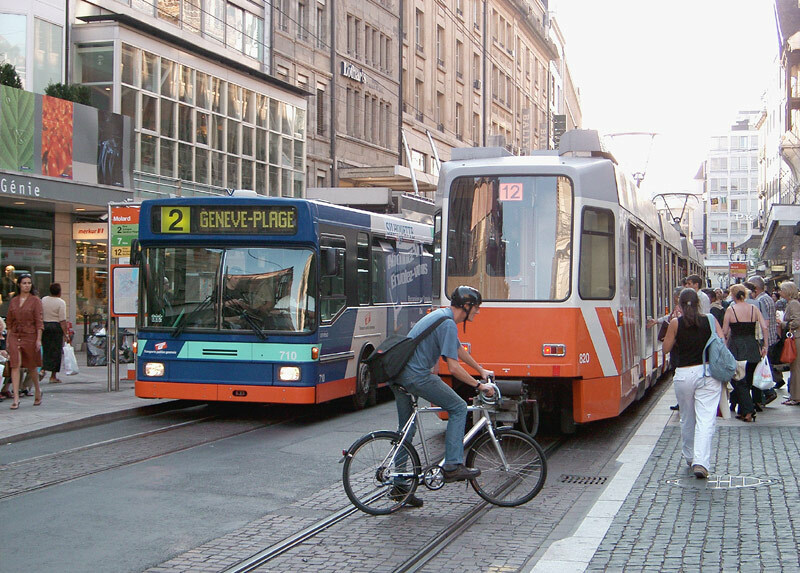 In Geneva they have found that the sight of the overhead wires is seen as a positive advantage, because "people see the wires and know that quality public transport comes here" (ah, so different to this country). 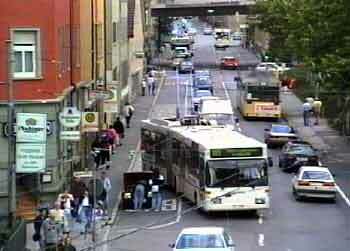 Trolleybuses Are Flexible Enough To Avoid Road Obstructions! Trolleybuses can travel with the overhead wires either directly above or to one side of the vehicle. Usually their ability to 'wander' is by as much as four metres, which equates to three traffic lanes. Apart from helping them to fit in with existing traffic flows this ability to switch lanes also gives them an ability to around obstructions, such a broken down cars. Trolleybuses have the flexibility to go around obstructions, such as broken-down cars! Esslingen, near Stuttgart, Germany. 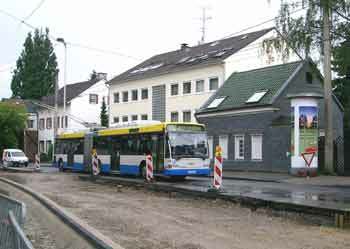 The above image is a video-still - click the image or the projector icon to download a 17 second video clip named 'Esslingen-go-around320.mpg' which shows the action being described as well as a duo-bus running with its trolleypoles down. Flexibility also means easily coping with having to use the other side of the road when road reconstruction results in single alternate lane working under the control of temporary traffic signals. Solingen, Germany. Gdynia, Poland. 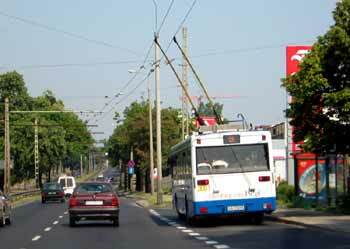 Because trolleybuses can use several traffic lanes so at bus stops with dedicated pull-ins the overhead wires just need to be slewed towards the pull-in to be suitable whether the trolleybuses are calling here - or not. http://commons.wikimedia.org/wiki/File:Gdynia_trolley_July_2006.jpg A simple passing loop in the overhead wires allows a moving trolleybus to pass a stationary trolleybus. Lausanne, Switzerland. Many modern trolleybuses are also equipped with either a low power fossil fuel engine or batteries so that if they need to travel away from their wires they can do so, albeit perhaps at reduced speed. Another use for these secondary power systems is in the depôt, giving them the ability to gain access to every part of the facility without having to provide sufficient wiring. In most instances these APU's will only be for emergency (& depôt) use allowing the vehicle to travel a short distance around an obstruction (eg: a road traffic accident) at reduced speed. However in some cities they use more powerful alternative power systems as this can give the possibility of scheduled operation of longer distance off-wire travel too. In Landskrona, Sweden - which opened a small brand new trolleybus system in 2003 - the bus garage is unwired and around 1km away from the nearest wiring. The first vehicles in the fleet use batteries to power the trolleybuses between the bus garage and the service wiring, but when increasing passenger numbers (from 200,000 to 500,000 a year) resulted in fleet expansion it was decided that the new trolleybus should be equipped with a low power diesel apu instead. 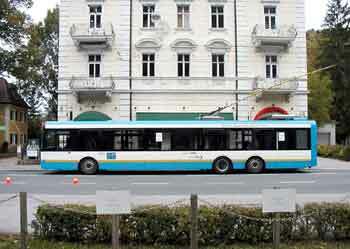 With passenger numbers still increasing 2013 saw another trolleybus being added to the fleet. 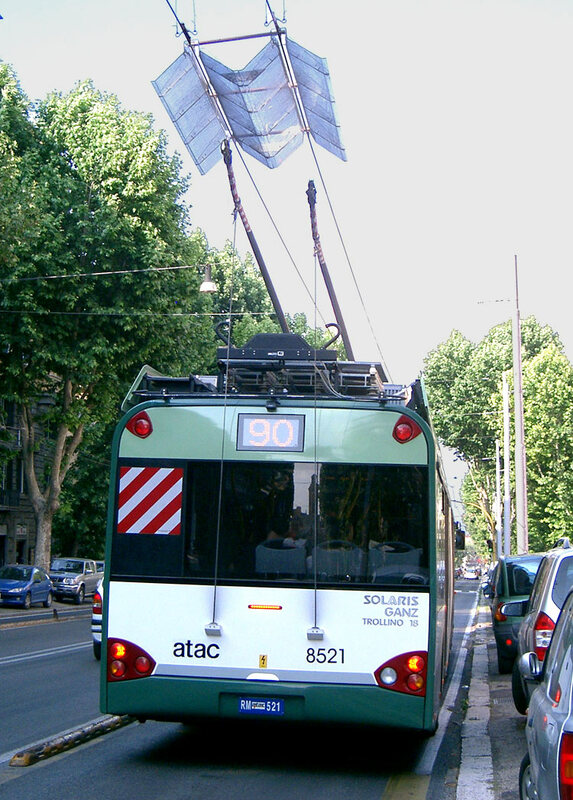 Rome's first present-era trolleybuses feature batteries powerful enough to allow as much as 3km of unwired operation through the heart of the city centre, albeit with the air-conditioning switched off. The option which Rome did not want to follow is to use what is known as a duo-bus (see below) - this was for reasons of air quality. In Beijing, China, all the routes crossing the main east-west boulevard or operating through the central shopping streets do so using powerful batteries which permit quite smart acceleration and several kilometres range at 30-40 km/h. After crossing the visually sensitive areas the trolleybuses are driven into a marked box on the highway where the driver depresses a button to raise the trolley booms hydraulically into inverted V-shaped re-wiring troughs on the overhead. As with Rome's trolleybuses the batteries are recharged during the remainder of the journey. Rome trolleybus raising its trolleypoles to switch from battery to overhead-wire power. In the view on the right the pick-up has yet to properly locate itself around the overhead wires. Duo-buses are 200% power vehicles which can operate freely - at full power - in either electric or fossil fuel modes. 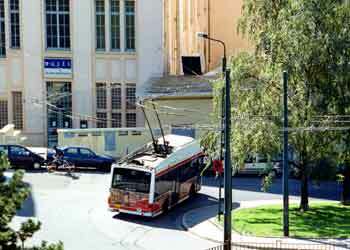 When in electric mode they operate as trolleybuses, collecting power from overhead wires via twin trolleypoles. 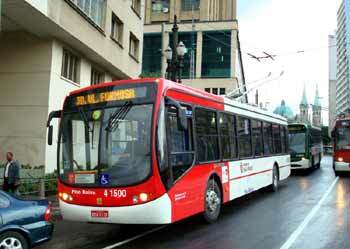 In diesel mode they use a normal mechanical transmission system, just like normal diesel buses. These are NOT hybrid buses, there is no energy storage - they are strictly diesel or electric at different times. Used in a few cities globally, duo-buses are usually fitted with motorised trolley poles, so changing between modes is simply a case of the driver stopping and pressing some buttons - (s)he does not even have to leave the cab! When raising the trolley poles correct placement is ensured by fitting inverted 'V' shaped wiring guides to the overhead wires, naturally for them to be effective the vehicle must stop in the correct location, so it is very important to prevent illegal parking at the up-points. Lowering the poles can take place anywhere, even when the vehicle is moving. In either case modal changeover takes less than a minute so when it is located at bus stops the only delay to the service comes from the time taken for the passengers to pay the driver as they board. Duo-buses are more suited on routes where buses need to operate significant distances beyond the range of the overhead wires but the route is infrequent and therefore electrification is not commercially viable. Apart from the effects of the waste gases the primary disadvantage of the duo-bus is that the weight of the two drive systems increases their unladen weight and if this brings them close to the legal weight limit for buses it potentially could reduce the passenger carrying capacity. Esslingen, Germany duo-bus using its auxiliary diesel engine to go around a maintenance crew working on the overhead wires. Massachusetts Bay Transportation Authority (MBTA) Silver Line Dual-mode bus departing South Station to serve SL2 Waterfront Line in Boston. Image & license: Xb-70 / Wikipedia encyclopædia. Public Domain. 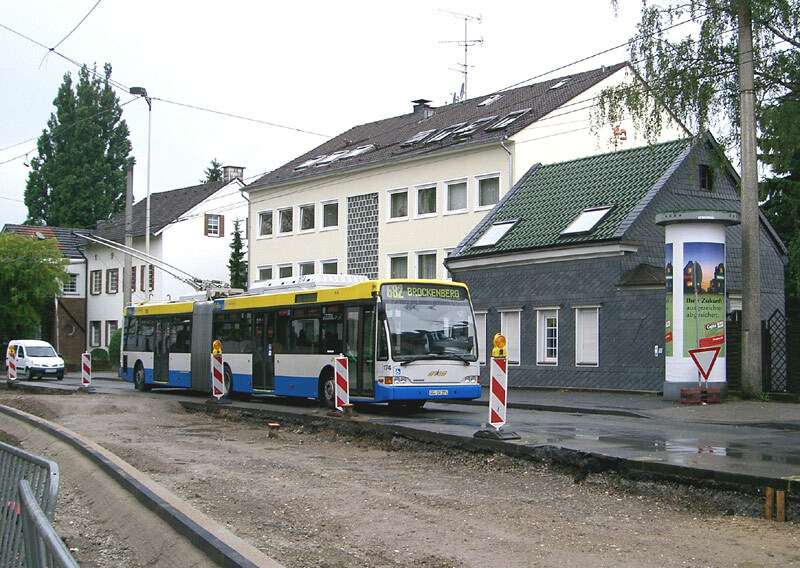 In the late 1980's and early 1990's the German city of Essen had a fleet of duo-buses which mostly ran as diesel buses when on surface sections of route and as trolleybuses when travelling through part of the city's underground tram / light rail system. (full version, with many pictures). 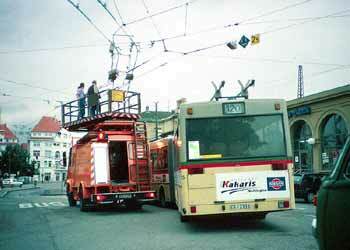 This image shows one of the duo-buses raising its trolleypoles whilst stopped on a tunnel entry ramp. NB: The clickable large image has been sourced from S-VHS-C videotape and is a little fuzzy. 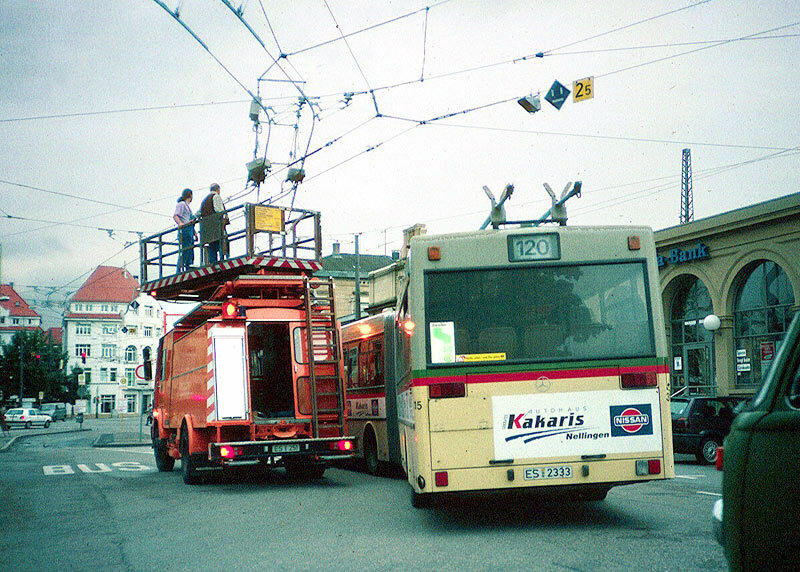 This film dates from 1990 and was taken at the Viehofer Platz bus & tram stop which in 1991 was replaced by the tunnel extension, which (as other YouTube films show) was also used by the trolleybuses! In 1986 a planned trolleybus scheme in Bradford was scuppered because the British deregulated bus operating regime - which actively encourages cut throat 'free-for-all' competition between private bus companies often plying the same streets - encouraged a 'spoiler' company to split the fare base by introducing a rival service (along the same route) which would compete by providing part-time services using cheapo secondhand minibuses. A negative side affect of this was that the perhaps little-known proposals for trolleybuses in the nearby towns of Doncaster and Rotherham were also scrapped, although the planned tramway in Sheffield is now a reality. With the Doncaster and Rotherham schemes in mind a prototype double deck trolleybus was built and a short stretch of overhead wiring erected between a bus garage and the nearby Doncaster racecourse, with these trials proving that it would be possible to build a trolleybus at very low cost with virtually no changes to the chassis and coachwork of what was otherwise a 79 seater diesel double deck bus. Since then it has become pretty obvious that the free-for-all system of bus operations actively inhibits serious fixed-infrastructure transport investments - indeed it also lead to the near bankruptcy of the Sheffield tramway when rival bus companies set out to compete with the trams by offering low quality secondhand buses and dirt cheap fares. The only city on the British mainland where cut-throat 'free-for-all' deregulation does not apply is London - here the competition is for the right to operate pre-defined bus routes under contract to the London-wide regional government body for transport, this being known as "Transport for London" (TfL). 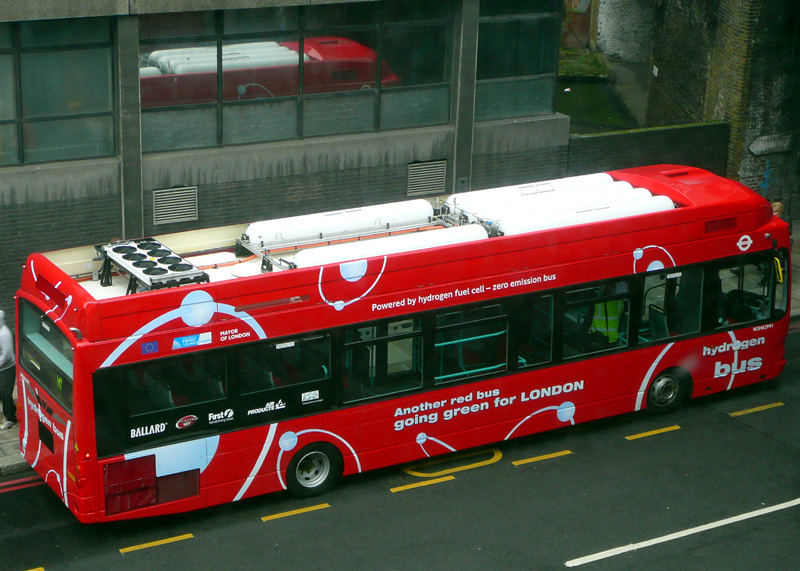 London Buses Ltd in its publication "Cleaner Air for London - London Buses leads the Way" estimated that the cost of (human) health care which results from diesel bus air pollution equates to an equivalent of €0.20 (ie: 20 Euro cents) per km. Meanwhile, a different report prepared at the Roma Tre university in Rome suggested the cost as being €1.20 per km. As most readers will instantly note, the Italian figure is significantly larger! Using this figure helps justify for the investment in the new "filobus" (the Italian word for trolleybus) network detailed above because it suggests that installing the electric street transports would result in significant financial benefits in reduced health care costs. At a presentation given by the TfL Managing Director for Surface Transport he made it quite clear (in a response to a question I asked him) that his primary duty is to run a cost effective transport system and that it would not be commercially viable to care about environmental issues, which in his view are for the government to decide. (He included issues which affect human health in this comment). Then he added that obviously if the government introduced new legally binding standards and / or someone else came up with the dosh (cash) then the situation could change. It is a most terrible (even criminal?) indictment of our present-day system of government that under British financial criteria the Italian proposals would be seen as "uneconomic". Do we in Britain not value human health? (rhetorical question, of course we the people do, even if our leaders and decision makers just pay lip service to the issue) or is it because of the insane way in which the British government allocates funds to its various departments, with health care costs coming from a different 'pot' which is (not only) totally independent of the transport 'pot' but actually (at a governmental level) competes vigorously for funds against the transport 'pot'? Poor health caused by air pollution is a big problem in London and with as many as 7000 diesel buses on London's streets it stands to reason that they must be part of the problem - with zero-emission (at point of use) electrically powered trolleybuses being part of the solution. In 1999 more Londoners died of air pollution related illnesses than in road traffic accidents. According to a report published by the Chartered Society of Physiotherapy - CSP - the PM10 air particles which are emitted mainly by diesel engines pose such a serious threat to public health that the World Health Organisation (WHO) believes there is NO SAFE exposure limit. The CSP's analysis revealed very high levels of this dangerous pollutant - not just in London but throughout the UK. The full story used to be found at the link below, however in the intervening time since this page was first written both it and the london.gov.uk links lead to pages which seem to have been deleted. Modern British trolleybus built in the 1980's to promote new trolleybus schemes in the South Yorkshire towns of Doncaster and Rotherham. Because of bus deregulation these failed to happen and this vehicle now lives at the Sandtoft trolleybus museum. 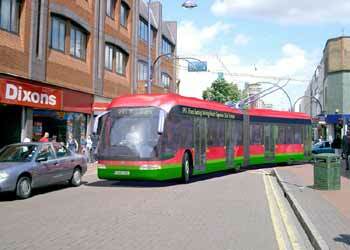 Artist's impression of a trolleybus for the East London Transit scheme (see below). based on a backdrop supplied by me. In the late 1990's a serious proposal was made for using trolleybuses in London, but only as part of a small local area "rapid transit" scheme (named East London Transit) where the sole reason for suggesting trolleybuses was because the projected ridership would have been too low to justify the cost of installing a new tramway. 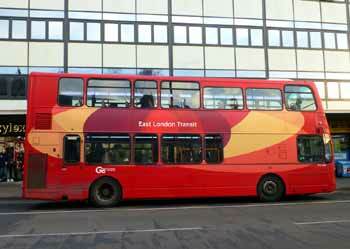 According to the "East London Transit - Summary Report" (published by TfL in July 2001) the use of trolleybuses on this 33 mile (53km) high-profile Bus Rapid Transit system for east London & metropolitan Essex would provide the most financially beneficial option, generating revenues 24% higher than a comparable diesel bus scheme. Public consultations in the areas to be served by ELT were very positive too - especially towards the trolleybuses with public opinion being 2:1 in favour of the clean electrics AND against yet more polluting dirty diesel buses. Yet despite this TfL back-pedalled and the ELT uses diseasel (disease diesel) buses. To avoid duplication and side-tracking further information about ELT and modal choice political machinations are on the A Bus For London. page. The Need For Trolleybuses In Britain! According to a Government report issued by the Committee on the Medical Effects of Air Pollutants air pollution hastens the deaths of between 12000 and 24000 British people a year and is associated with 14000 and 24000 hospital admissions and re-admissions - causing sufferers and their families untold amounts of misery and costing our health service & taxpayers £billions. Yet whilst motoring offences (especially speed related) seem to be attracting ever more diligent attention by the various authorities the issue of air pollution only receives the metaphorical "lip service". In Britain more people die from air pollution than in motor vehicle accidents. The total deaths from road traffic accidents (including pedestrians knocked down) is approx 2,538 (DfT figures, 2008) - and whilst obviously even one fatality is too many the figures are still considerably fewer than the number of casualties which can be attributed to air pollution. So, 50 years after the clean air legislation resulted in the ending of coal sourced smogs the air that we breathe in our towns and cities is yet again so heavily polluted that people are suffering ill health (and even dying) from it. Many of the most severe sufferers are our children, who when in the street environment are at the right height to breathe in large quantities of particulates as they are blown about by passing traffic. It is no wonder that the incident rate of childhood asthma is now at a record high in our towns and cities. So (once again) maybe its time to take urban air pollution seriously??? Introducing trolleybuses into British towns and cities would have helped Britain meet its commitment to cutting carbon dioxide emissions by 20% by 2010. The House of Commons environmental audit committee says that carbon emissions from transport are 'still moving in the wrong direction' but apart from clobbering motorists with yet more taxes the govt. has failed to find effective ways to entice people out of their cars. Amazingly with respect to new tram schemes the government actually took pro-active steps to deter these from coming into reality by making their installation more expensive - see the Enough Stick! How about Some Carrot page for more information. By attracting car users who would not switch to a motor bus electrification of Britain's urban bus routes could help reverse this upward trend. This would also help reduce overall road traffic levels too. "The combination of these factors makes the consideration of Trolley Buses low on our current plans for investment." It could be said that the optimum solution for us here in Britain would be to use the same planning processes as are already used for highway improvement schemes, the introduction of bus lanes, bus stop shelters, new traffic signalling systems, replacement of street lighting etc. After all, the works for installing trolleybuses - erecting the overhead wires, building substations (etc) to power these wires and arranging connections to the national grid - will be considerably less disruptive to other road users than road works and about the same as the replacement of street lighting poles. 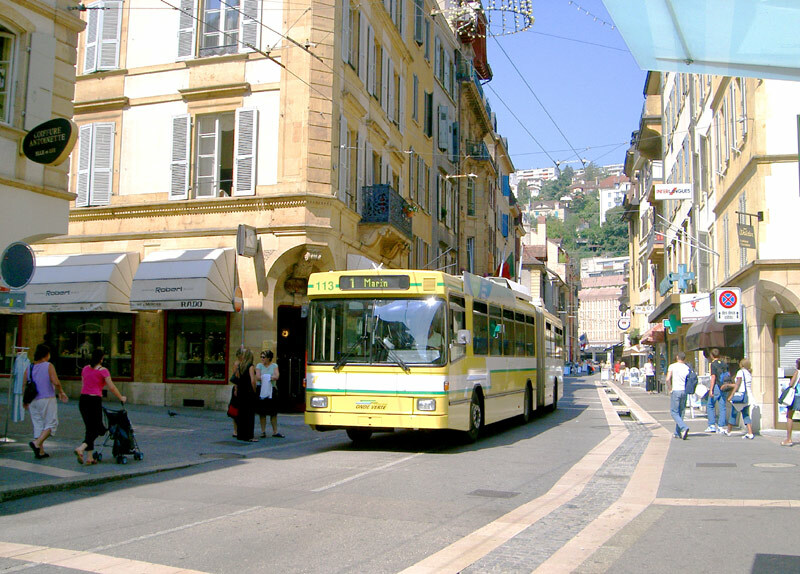 If new trolleybus systems were installed in conjunction with local government declaring the route a "high profile quality bus scheme" (such as already exist in a few locations) it should be possible to prevent spoiler companies from introducing rival services using cheapo secondhand motor buses designed solely to split the fare base and push the quality buses off the road. 18 Months Or 18 Years? The British planning process is so very slow that it is looking likely that by the time it opens the Leeds trolleybus scheme will have taken over 18 years to reach fruition. 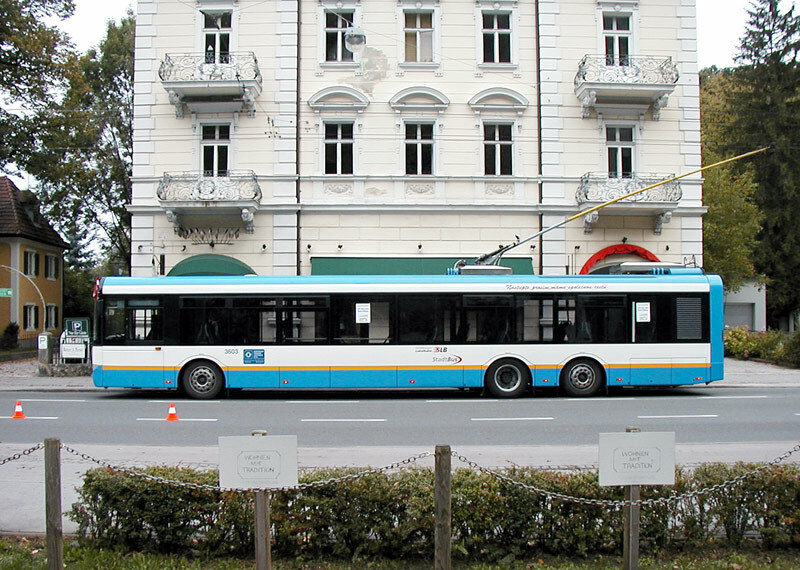 By way of contrast, in Salzburg, Austria a conversion of a diesel bus route to trolleybuses took 18 months - including all the planning and installation works. That is quite a time difference! It is not for nothing that the British planning system is said to encourage paralysis by analysis. Detailed studies of costings for new trolleybus systems in Britain have shown that installing the physical infrastructure (overhead wiring and substations) will work out at around £500,000 per kilometre. Of this about half would be for the wiring and support poles, etc., and about half the substation, feeder, etc. The costs of manufacturing and planting the (steel) support poles usually represents the largest item of the actual wiring costs, although once installed they would be expected to last for many decades (....indeed many of the poles planted in the 40's and 50's in towns around the country are still in use for street lighting and the aborted Bradford trolleybus proposals of 1986 would have re-used some of the still extant poles in that city in this way). 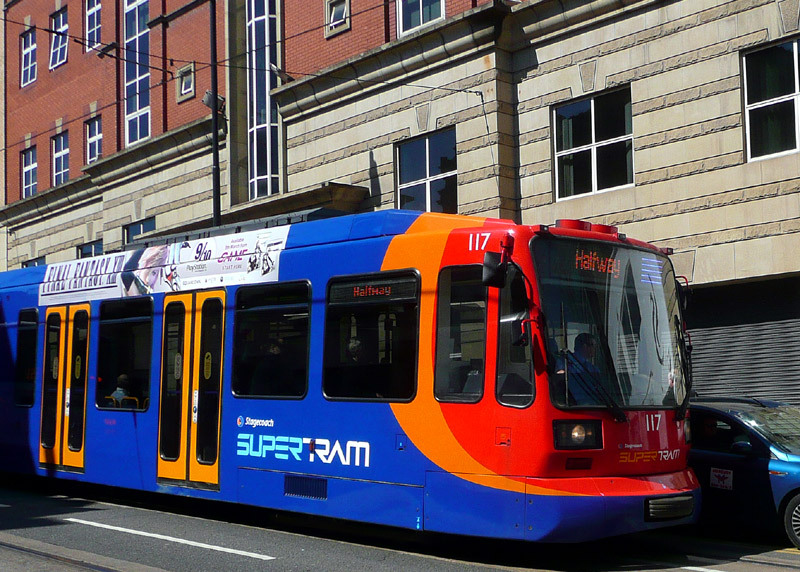 Some street sections of the Sheffield Supertram system feature overhead wiring supported invisibly from rosettes attached to building walls. Similar could be done for trolleybuses too. To reduce street clutter it is often possible to hang wires from wall rosettes on buildings - although unfortunately only certain types of buildings are suitable for this. Alternatively it should be possible for the same poles to carry both overhead wires and street lighting - but this would still require the installation of new support poles as ordinary street lighting poles will not be strong enough to support overhead wiring (and the extra work involved in this latter option could see costs rise). It is very possible that an enterprising electricity supply company would be interested in a mutually beneficial financial arrangement with respect to physical infrastructure and long term electricity supplies. 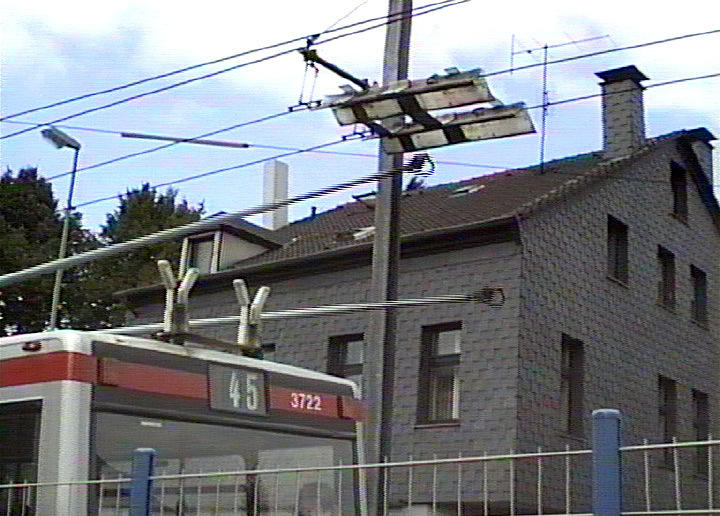 Something else which could affect the overall cost of the overhead wiring would be whether the trolleybuses are equipped with auxiliary power units (APUs - either battery packs or diesel generator sets) which allow the vehicles to operate away from the overhead wires. APU's will increase vehicle costs but then there probably wont be a need to install wires for access to the depôt - which could result in a substantial financial saving as to wire a depôt internally can require a great deal of 'special work' - points / switches / frogs, crossings, etc. - which are always very expensive compared with plain wiring. The nature of the wiring and its source can also cause costs to vary. 'Elastic' overhead wiring from, for example Swiss sources could result in costs working out more than the £500,000 per km quoted above, which assumed British sources. 2013 Air Pollution Update: Government Taken To Court! The links below were added to this page in July 2013 and the data in the articles they lead to suggests that the issue of urban air pollution situation is still very serious and includes what amounts to the government seeming to just not care about air pollution and its effects on human health. However, the Government's reactions were seen as being mediocre, so in 2016 it can expect to find itself back in a court of law! Other Types of Electric Buses. This section looks at some other types of electric buses. Batteries are already well known, and in recent years capacitors have become robust enough to start being used either alongside or instead of batteries. In addition, there are some emerging ideas which may become the solutions of tomorrow. These include frequent fast charging of batteries and power collection from the road surface below the bus. These topics are explored on Electric Buses page 2.
and the March / April 2014 bi-monthly magazine published by BusesWorldWide http://www.busesworldwide.org . Why even so called "clean diesel" is still an environmental disaster! Diesel exhaust has been found to contain over 41 different toxins, many of which form part of the particulate. These toxins are still present in "clean diesel" powered vehicles which use Ultra Low Sulphur Diesel fuel (ULSD) and Continuously Regenerating Particulate Traps (CRT). Vehicle emissions have their greatest impacts on those directly exposed, i.e. pedestrians, transit users, those living on busy transport corridors. Electric buses produce no in-street emissions. Unless all the emissions diesels release into the surrounding air can be completely eliminated, the diesel can never be competitive with an electric bus in terms of emissions impacts. This should not imply that efforts to reduce diesel emissions are wasted. Since diesel engines will continue to be used for a variety of purposes, every effort should be made to make them as clean as possible. But one needs to realize that making an internal combustion engine cleaner does not make it a universal substitute for an electric vehicle. So called 'cleaner' diesel increases greenhouse gases! In Lyon, France trolleybus route No. 6 operates over some narrow, twisting, hilly roads which are unsuitable for full-size buses so uses a fleet of half a dozen specially constructed 27 seat (53 passenger total capacity) 9.7m long, 2.4m wide midi-trolleybuses. The significance of this is that in the bus building industry (as in many other industries) the cost per item (bus in this instance) is quite a bit higher when only a few are built compared to large productions runs when a lot are built. 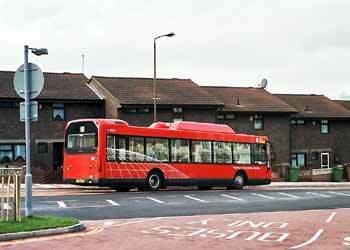 Yet despite this it was found more desirable to use trolleybuses than fossil-fuelled buses. Serious Negative Environmental Repercussions Of Global Proportions! The environmental benefits of exhaust after-treatment devices was recently called into question when researchers discovered rare heavy metals (eg: platinum, rhodium, palladium) from catalytic converters embedded in the ice in remote regions of Greenland. A European Commission study found that vehicle exhausts actually erode the metals in these devices, ejecting microscopic particles into the air. Some of these metals have also been linked to asthma and lung conditions. Researchers noted that some of these particles are soluble, meaning that they can be readily absorbed by vegetation and enter the food chain. New Scientist magazine concluded that this is already a problem is of global proportions. Is A Global Problem That Also Stands To Threaten Human Health. Nancy, France. These innovative three-section double-articulated TVR trolleybuses were designed to give a tram-style ambiance to rubber tyred road vehicles - this being something which they have achieved admirably. The TVR concept allows for the vehicles to operate in either driver-steered mode (as regular trolleybuses) or pseudo-tram mode using a proprietary guidance system which is totally independent of the vehicle's propulsion system. Unfortunately some unenlightened transport pundits have quite incorrectly used this latter feature to suggest that ALL trolleybuses are 'guided' (aka self steering) buses. Worse still, they are hoodwinking the general public into believing this blatant untruth. Click the projector icon (or here) to see a 14 second video clip named 'Nancy-unguided-S-bend320.mpg' showing the TVR making this 's' shaped manoeuver (plus hear the above photograph being taken - oops!). So called 'cleaner' diesel fuelled vehicles still emit lung-damaging particulates! Trap devices such as the CRT primarily focus on reducing the amount of particulate matter that diesels spew into the surrounding air; there is also some concurrent reduction in hydrocarbon emissions. 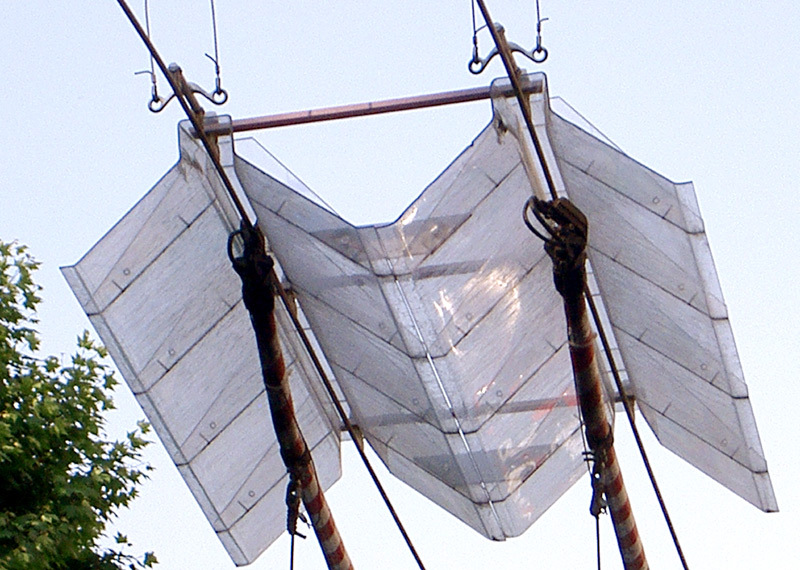 Some traps claim to reduce particulate emissions by up to 90% in tests, although their performance in real-world conditions may vary considerably. In any case, some particulate is still released, and because "clean" diesel particulate is so much finer than that from conventional diesel engines (and invisible to the naked eye) these toxins have an easier time entering our bodies and penetrating the linings of the lungs. There is no safe level of exposure. German researchers insist the toughest diesel emission standards are not tough enough. (PM10 particles with mass less than 10 microgrammes). The Daily Mail of December 27, 2000 reported that such particulate was found deeply imbedded in the lungs of very young children, in particular children who lived in homes located along busy roads. This particulate is believed responsible for an increase in lung disorders and asthma and has also been linked to heart disease. The incidence of asthma in children under five has doubled in Britain in the last ten years and is on the rise in many other countries. There is also strong evidence for a causal link to cancer, although the research as not (yet) established this beyond doubt.. These trap devices do not remove the Oxides of Nitrogen (NOx) which forms a major component of diesel exhaust and poses one of the most significant health risks. Oxides of Nitrogen essentially comprise a mixture of Nitric Oxide (NO) and Nitrogen Dioxide (NO2). NOx is transportation's principal contributor to urban smog and poor air quality. In combination with the moisture in the lungs, Nitric Oxide (NO) forms nitric acid. This acid results in inflammation, leading to chronic respiratory problems. Eventually, all Nitric Oxide emissions are converted to Nitrogen Dioxide (NO2) in the atmosphere. Nitrogen Dioxide is a corrosive and very poisonous gas. At concentrations above 150 ppm it leads to death. The CRT (Continuously Regenerating Trap) uses a catalyst to convert Nitric Oxide in the exhaust stream to NO2 because it needs the NO2 for a reaction that 'burns off' particulate matter and hydrocarbons. There is a strong likelihood that the proportion of NO2 in the NOx emitted by CRT equipped engines operating in real world conditions will be greater than is the case with non-CRT equipped diesels. If so, it would put a greater quantity of the more poisonous constituent of NOx emissions directly into the airways of pedestrians, transit users and area residents than would be the case with conventional diesels, where the a slower process of oxidation in the atmosphere would be required to yield the same quantity of NO2. In other words, there is every possibility that ULSD in combination with the CRT may actually intensify some of the health effects of diesel exhaust. In addition, CRT traps require periodic regeneration, which is when the ash they collect needs to be burnt off. This process is nornally automated, all it requires is that the CRT runs much hotter than when in normal mode. This process is easily achieved when a vehicle is travelling in excess of 40mph - this being much faster than a speed that urban buses usully reach. If the trap is not able to regenerate in this way it can be damaged and will then need replacing. 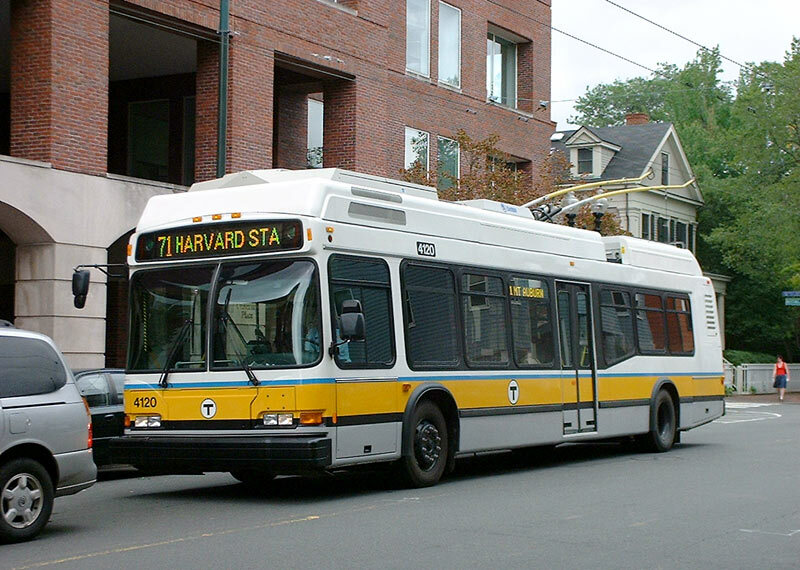 MBTA trolleybus operating near Harvard Square in Cambridge, Massachusetts (USA). 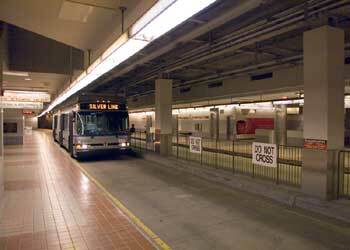 The offside door is used at Harvard station in the bus tunnel. 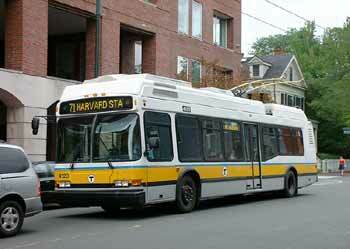 http://commons.wikimedia.org/wiki/File:Trolleybus4120.Harvard.agr.JPG. 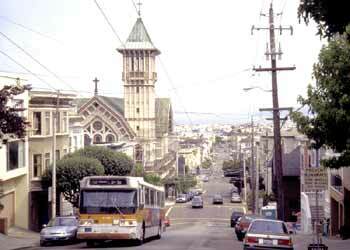 Trolleybuses make light work of steep hills - San Francisco, USA. The case for NOT using fossil fuel engines which meet "Euro 4 / Euro 5" emissions standards for urban bus services. Introduced in 2006 were regulations called "Euro 4" which had the aim of enforcing a reduction in the output of harmful particulates and NOx nitrous oxide from motor bus exhaust (waste) gases. Euro 4 formed a stepping stone to "Euro 5" which in 2009 cut NOx pollution (but not particulate emissions) even further. 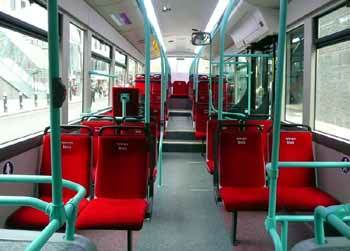 Both regulations applied to new buses only. As their name suggests, these are European Union standards, proposed and promulgated by the European Commission in Brussels. Of course it is right to use the propulsion systems which create the least pollution - and for rural areas where the cost of electrification plus maintenance of the infrastructure would simply render the bus service uneconomic then by using sustainably sourced biofuels in engines which meet the highest possible standards for internal combustion engines is a logical solution. But there really is no justification for using the "less dirty" option for urban services - not when a clean alternative choice exists. In an effort to meet the Euro5 regulations motorbus suppliers are following two competing routes. These are known as EGR (Exhaust Gas Recirculation) and SCR (Selective Catalytic Reduction). EGR uses an EGR cooler to reduce the temperature of a controlled amount of exhaust gas which is then recirculated into the engine to achieve lower combustion temperatures. thereby reducing nitrogen emissions at source. Up to 18% of gases are recirculated for Euro 4 and 30% to meet Euro 5. Instead of modifying the engine the SCR system is a multi-stage exhaust gas after-treatment. Typically for buses a mixture of 32.5% urea and deionised water (known as AdBlue) is injected into the very hot exhaust gases, with a chemical reaction converting this into ammonia. This then reacts with the nitrogen dioxide (NoX) component of the waste gases in a catalytic converter to form harmless nitrogen gas and water vapour. At all times a vehicle must have an adequate supply of AdBlue in the tank, as otherwise there is a risk of damaging the SCR system. To prevent such damage automated systems will initially prevent the vehicle from running and then after it has stopped switch it to a reduced power (60%) LIMP mode. On urban buses the waste gases must also pass through another catalytic converter which is fitted in front of the SCR catalyst. This is to ensure that the SCR system functions under operating conditions with low exhaust temperatures. In cold climates the AdBlue starts to freeze at -11 deg C and until the engine is running and giving off heat the effects of the exhaust filtration system will not be felt. Vehicles which operate in climates where such temperatures are frequent can be equipped with heated Adblue tanks. According to SCR advocates for the Euro4 standards urea consumption is 3-4% of diesel so 40 litres of Adblue should be sufficient for about 1000 litres of diesel. For Euro 5 it is 5% of diesel consumption. The liquid itself is claimed to be low-toxic, non flammable, not explosive and not pose any known human health risk. Unlike fuel oil there are no special restrictions regarding its transport or handling. The urea consists of ammonia and carbon dioxide and the production process involves airborne nitrogen reacting with hydrogen from a source such as natural gas. 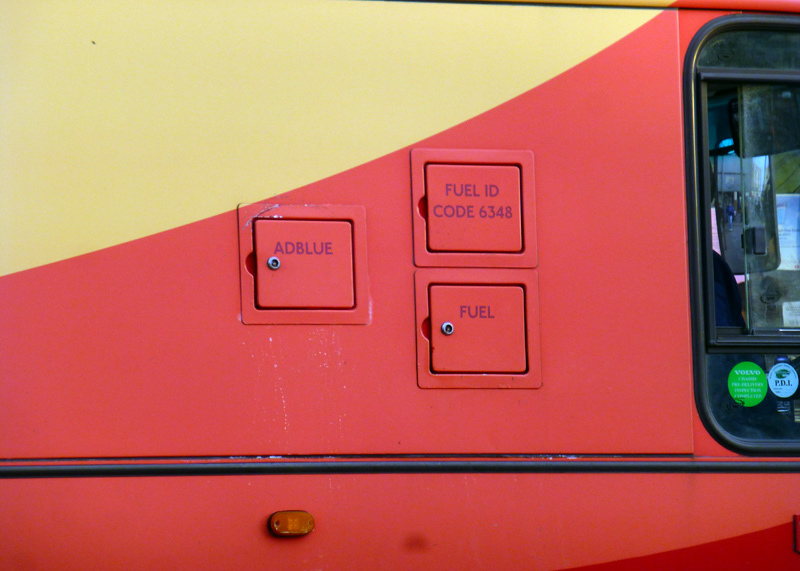 There was a time when fuelling a bus would have been a simple, fool-proof operation. However, nowadays one must remember to add the correct liquid to the correct tank. At least the flaps are labelled! The fuel ID code number identifies the specific vehicle. 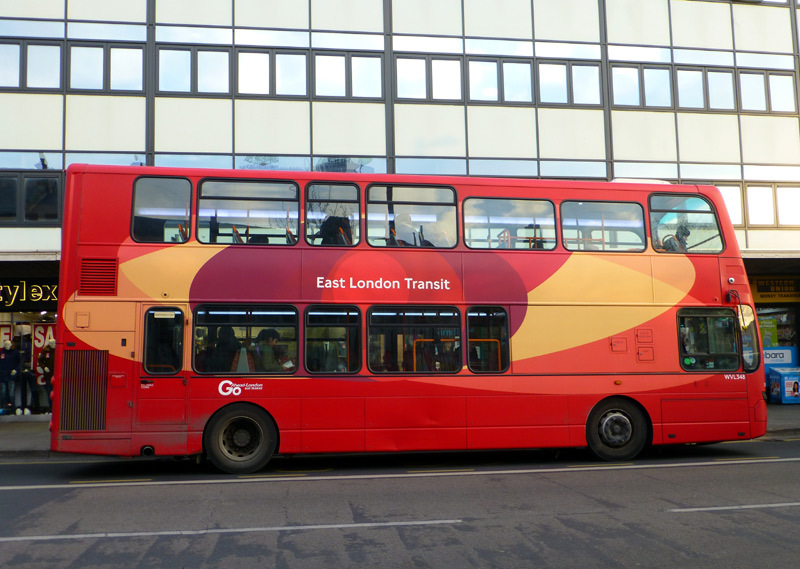 These are Wright Eclipse Gemini 2 buses on London's pseudo-BRT 'East London Transit' service. In April 2014 research for Euro6 data for this text found that a company was advertising that it would disable the SCR system through ECU reprogramming in a way which would not leave any traces of the system being inactive, including there not being any fault codes on the dash or in the ECU. This way the vehicle could still be taken to dealers for servicing without them noticing the change. They added that since the MOT test only checks that the Adblue warning light illuminates and then goes out when the engine is started so therefore the vehicle would still pass the MOT test. Included in the procedure is a remapping of the engine which changes how it burns its fuel oil in a way that provides better performance, more torque and increased efficiency - including a very significant 10-15% reduction in diesel consumption. As of 2014 a more stringent Euro6 standard has been introduced which to meet will see vehicles also needing a Diesel Particulate Filter (DPF) which removes fine particles and smoke from the combustion process. London's Mayor Exposes the truth about "Euro 4 / Euro 5" emissions standards. However apparently 'clean' Euro 4 / 5 diesels may appear to be it need be remembered that the supposed performance is measured on new vehicles / engines in tip top condition on test cycles on a test track - and NOT on real-world emissions as per our streets. No matter how clean they are when new, experience with existing engines has shown that as they age (and even with perfect maintenance) their emissions performance deteriorates. In April 2014 the then Mayor Of London (Boris Johnson) revealed in a newspaper column "the motor manufacturers have been able to diddle the Commission: the cars and trucks have appeared to conform on the test tracks; but when it comes to everyday use, on real streets, it is a different story". There are no such things as clean diesel vehicles. Just "less dirty". (and maybe not elsewhere either). Many of these comments also apply to ethanol, which some bus operators see as a 'green' (sic) solution. As oil prices soar and some people feel a desire to source fuel from renewable sources so there is increasing interest in what is known as "biodiesel". Biodiesel is usually sourced from vegetable oils derived from plants which are specially grown as a crop in a field, although it can also be sourced from animal fats too. The theoretical advantage of biodiesel is that it should be CO2 neutral, because as much CO2 should be taken up growing it as is produced when it is burned. However, if the crop is heavily fertilised using fertiliser that has itself been sourced from fossil fuel, and if a lot of fossil fuel is used harvesting, transporting, converting the crop to biodiesel etc., (ie; the normal sorts of agricultural usage of fossil fuels) then biodiesel may still be a net emitter of CO2. Sourcing Problems - with potentially disastrous ecological consequences. It is also important to note that if the crops from which the biodiesel has been sourced would have been grown anyway (eg: wheat & maize [corn], for human or animal consumption) then using them for liquid fuels does not provide any ecological benefit - indeed if the result is a shortage of food and a consequential increase in food prices then there is a significant disadvantage, especially to the less financially wealthy members of our human family (who might then not be able to afford to feed themselves adequately) and to farmers who may not be able to afford to feed their livestock. Reports from some countries suggest that people are going hungry because they can no longer afford to buy foods as the crops are being sold at higher prices for conversion into fuel. Other reports talk of gangsters stealing farmland to grow these cash crops, which frequently leaves the displaced farmers suffering severe hardship (eg: financial poverty, inability to afford to buy food, housing, healthcare). There have also been instances of corruption with the issuing of false certificates claiming that the crop has been sourced following the highest environmental standards - when it has not. There is also no point in tearing down the Amazonian / equatorial rainforest (something else which is happening) - just to grow crops for fuel - as this sort of deforestation is very much a disaster of the worst possible magnitude. One reason why these ‘rainforest replacement' plantations are less than desirable is the loss of biodiversity (ie: a wide range of types of plant which support many different animals are replaced with one type of tree which is not beneficial for many types of animal life). Indeed it seems that this loss of habitat for the animals which live in the rainforests is leading to a situation whereby one species of monkey is now actively threatened with extinction. It may be that other ‘lower profile' / ‘less well known' animal species also face a similar threat, however the media reports do not state this. It must also be remembered that the rainforests are our planets' lungs. Without them we (mankind) might have some more fuel, but we effectively will be signing the death warrants (through asphyxiation) of just about every oxygen breathing living being on the planet. The ideal crops to replace when growing crops for conversion to liquid fuels. Although somewhat off-topic for this page it must be pointed out that there are some cultivated crops which are already grown on a 'mono-culture' basis that are not at all essential to human life that could be replaced (with crops grown for conversion to liquid fuels) without negatively affecting the global ecology, bio-diversity, human food supplies, etc. Perhaps the principle constraint to this would be that plants grown for narcotics tend to be very profitable, but (hopefully) as long as there are equal (or even greater) financial (etc.,) rewards for growing plants for conversion to liquid fuels (or food, etc.,) so the people who grow these crops could be convinced of the benefits in changing what they grow. Bringing this into fruition may be politically challenging, but so are riots caused by people lacking food and transport. Conversely, a contented population is more likely to look kindly upon its leaders. The use of biodiesel does not turn buses into quiet zero emission vehicles - indeed very few people would notice any significant difference, apart possibly from the smell, which especially if recycled cooking oil is being used might result in the buses smelling like fast food outlets! However for buses operating on quieter routes and especially in rural areas (where electrification is simply not a viable option) then because it can be sustainably sourced so there is a good case for using biodiesel to fuel buses. Pure or mixed with regular diesel? When compared with mineral diesel the use of pure biodiesel to fuel a conventional motor bus engine results in a reduction of some pollutants and an increase in others. Biodiesel fuelled buses are just as noisy with the same levels of vibration as mineral diesel fuelled buses. Because the carbon in biodiesel emissions is recycled from carbon that was already in the atmosphere [rather than from "new" carbon from oil that was sequestered in the earth's crust] so net emissions of carbon monoxide (CO) and carbon dioxide (CO2) are lower. The emissions particulates are also lower. Biodiesel contains fewer aromatic hydrocarbons (benzofluoranthene & benzopyrenes). However there is an increase in the harmful nitrogen oxide (NOx) emissions. It is perhaps worth noting that the CO2 emissions from diesels into the streets only affects global climate change - it is not a direct human health issue. However emissions from diesel or other combustion engines into the streets of CO, NOx or particulates are human health issues. So whilst biodiesel may well have a part to play in reducing the use of fossil fuels and therefore reducing CO2 emissions, it is not a solution for reducing the noxious emissions like NOx from diesel bus exhaust pipes. Biodiesel has a tendency to gel at low temperatures (less than 4° C), it also suffers from issues with micro organism growth and water absorption. Because of the potential severity of these problems biodiesel is usually deployed mixed with regular diesel, perhaps on an 80-90% mineral diesel and 20-10% biodiesel basis. In this format the use of biodiesel has been found to extend the life of various engine components. This is at least partly because of biodiesel's higher lubricity index compared to mineral diesel. Some forms of biodiesel (eg: ethanol) have a lower 'energy' rating which means that for mile for mile more liquid fuel is consumed than with regular diesel. In late 2007, a bus company which operates local buses in the English town of Reading bought 14 new ethanol fuelled double deck buses to replace the existing fleet of biodiesel powered vehicles. At the time this was the largest order for ethanol fuelled buses in the UK. These buses were introduced into service in May 2008. However, in October 2009 it was discovered that instead of the ethanol fuel having been sourced from sugar beet grown in the English county of Norfolk (as everyone in Reading had been led to believe) it was actually made from wood pulp imported from Sweden. On learning this Reading Borough councillors launched an investigation into how they, the Reading Transport Board - which runs Reading Buses - and the people of Reading could have been deceived. 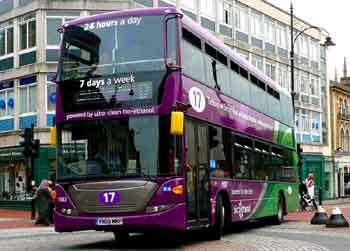 Reading Transport Ltd route 17 livery. 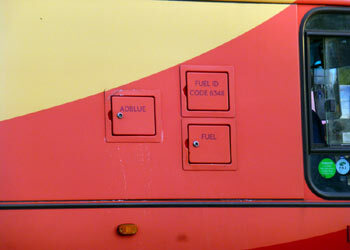 LPG is a low pressure mixture of propane and butane, which on the bus is stored at pressures between 4 and 7 bar. LPG does not contain any lead, sulphur or benzene. Overall it contributes 10% less to global warming than petrol - and 3.4% more than diesel. Compared with diesel buses, LPG buses emit 5 times as much carbon monoxide and consume 75% more fuel - making favourable tax regimes a necessity for bus operators to use this fuel. In the event of an accident where the LPG escapes into the atmosphere it would be much more dangerous than either natural gas or hydrogen in that being heavier than air it would behave like a liquid fuel (ie: petrol and diesel) and spread along the ground, which is where most people and buildings are usually to be found. As with petrol (but not diesel) LPG is highly flammable. Compressed natural gas is stored on buses at high pressures of up to 200 bar. CNG spark ignition engines are much less fuel efficient than compression ignition diesel engines - consuming 20% more fuel than low sulphur diesel buses. CNG bus exhaust may contain less NoX than diesel bus exhaust but it also contains more carbon-dioxide (CO2) than from diesel fuelled buses. In addition CNG buses also emit methane, which has a greenhouse gas value 21 times greater than CO2 - in effect this means that they actually increase greenhouse gas production by a typical 19% (compared to a low sulphur diesel bus). It has been reported that although the mass of particulates emitted by CNG may be lower than diesel, the particles are finer - so travel more deeply into our lungs. Both CNG and diesel require exhaust after treatment to try to limit noxious emissions. Compared with diesel buses, CNG buses are heavier, carry fewer passengers, have problems with range, are less reliable, more expensive to maintain and the cost of the re-fuelling facilities is horrendous. Transport operators who use them report that the overall lifetime costs of CNG tend towards being double those of diesel. So, not only have bus operators who use them found them to be financially less viable than diesel buses but despite all the politically-correct hype their use means that the global environment suffers a significantly worse 'hit' than it currently receives from diesel buses. In 1990 the Canadian city of Toronto introduced a fleet of CNG s replacements for both electric trolley and other buses. At the time they were hailed as being no-pollution replacements (sic) for trolleybuses, however within five years CNG operation had been withdrawn from the city. Whilst 50 buses were converted to diesel, 75 had very abbreviated lives and went straight to the scrap pile. It seems that few people want to talk about what has become seen to have been a disastrous money-wasting fiasco. 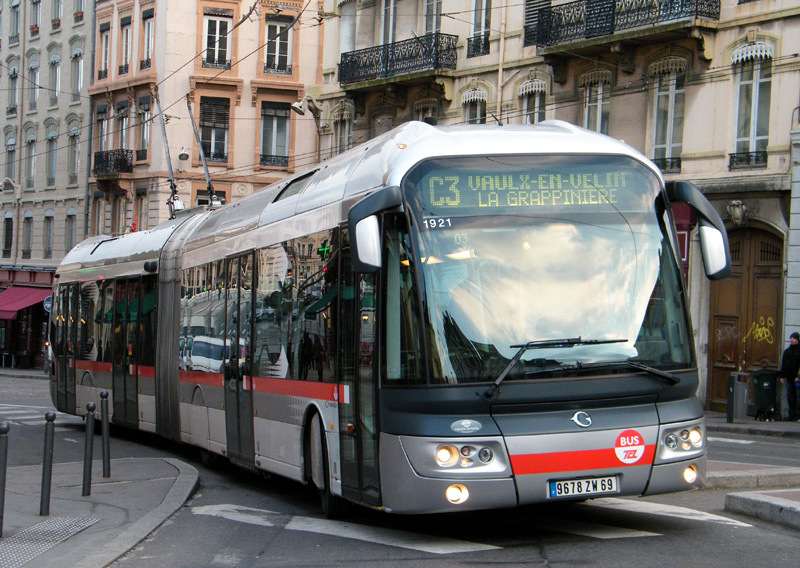 When a Swiss city introduced CNG buses to its fleet it also had to spend SFr400,000 (Swiss Francs) on the bus garage, including installing a gas detection system, creating an anti-explosion zone, modifying the ventilation system and improving both the fire detection and alarm systems. In addition SFr1 million was spent installing gas distribution, compression and storage facilities. 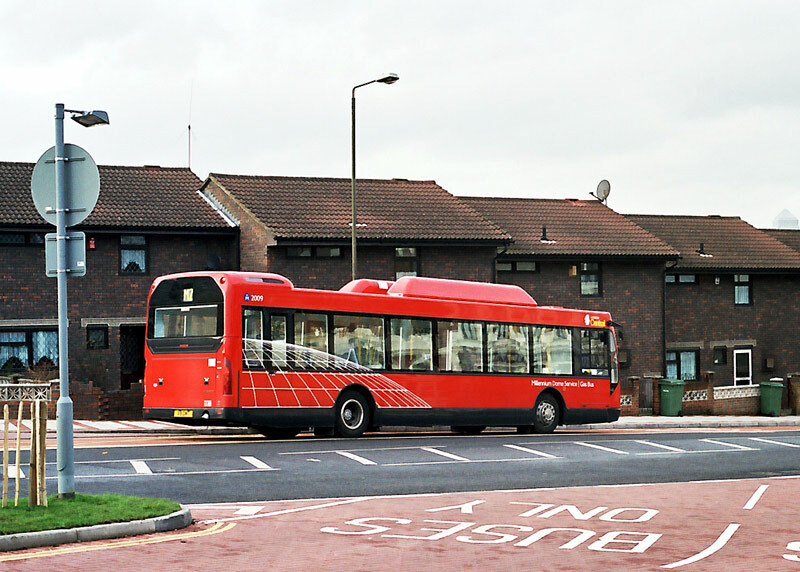 CNG bus on London's high profile Millennium Dome route M1 in 2000. Some people see buses which use CNG or LPG as being clean air options - even though these are still finite fossil fuels and have some environmental drawbacks more severe than diesel. Having experimented with fuel cells and found the technology to not be mature enough for serious use, in 2008 the Canadian city of Vancouver replaced its life-expired trolleybuses with a fleet of 230 new trolleybuses. 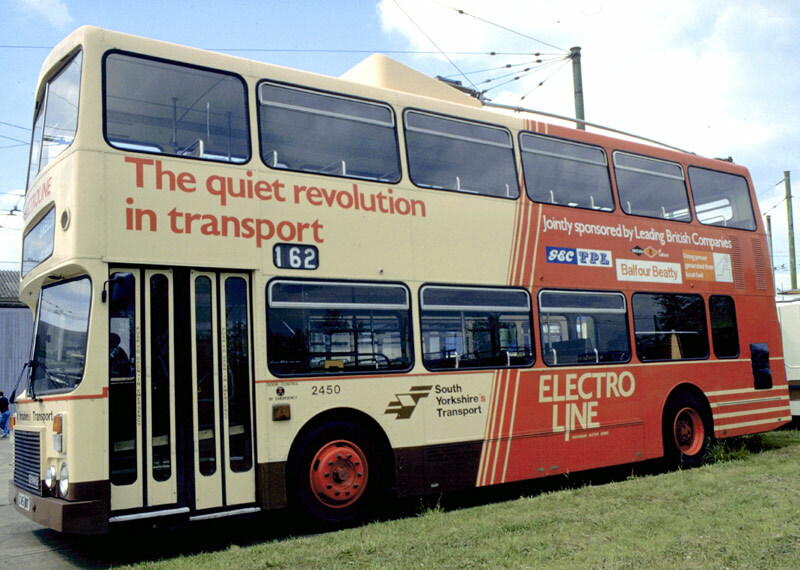 This image shows the first of the fleet and is sourced from the "yahoogroups" electric trolleybus discussion group. CNG gas poses such a safety hazard (explosion risk) that the Canadian city of Vancouver will not use CNG powered buses on roads which are served by trolleybuses - because of the risk to the gas from electric sparks! In some countries it is a legal requirement that the gas bottles are stored on the buses' roof, so that if there is a leak it will vent into the open air. Not all countries have this regulation - India for example has seen bus fires caused by gas bottles located under the passenger seats. Regulations also sometimes prohibit gas buses from being garaged underground. In France CNG is known as GNV (Gaz Naturel de Ville) and LPG is known as GPL (Gaz de Pétrole Liquéfié). In December 2003 London received three experimental Hydrogen powered "fuel cell" buses. This was as part of a global series of trials being carried out under the European Union’s CUTE (Cleaner Urban Transport for Europe) project. In all 9 EU cities were involved plus Reykjavik (Iceland), Perth (Australia) and Beijing (China). The reasoning behind the ‘CUTE’ program was to test the buses to see how they coped in different traffic and climatic conditions - which implied rigorous usage to test endurance, reliability, to look for weaknesses, etc. London was a key city in these trials because of its extreme stop-start traffic conditions where travelling for much more than a minute without stopping is fairly unusual. The trials in these 11 cities were part of a long-term development programme which previously saw the testing of one fuel cell bus in the Canadian city of Vancouver. In theory fuel cell technology sounds wonderful. 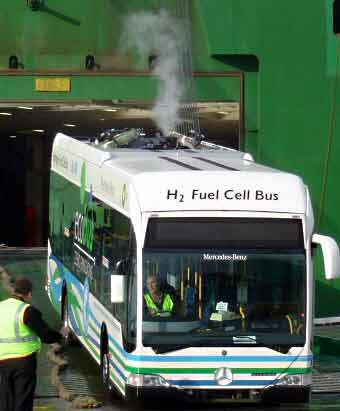 The hydrogen "fuel" stored on the bus is converted into electricity, with the only waste product being water vapour (ie: steam!). This means that these are electrically driven buses - and there is no pollution at point of use. For some reason these were not promoted as hybrid buses; possibly because the idea was not to detract from the use of hydrogen and that in that era the use of hybrid buses was little known. 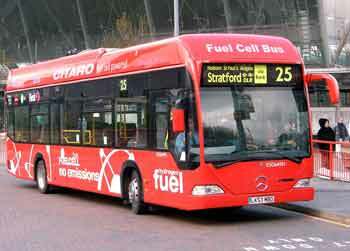 Fuel cell technology is still very much experimental and is so energy inefficient that whilst using these buses would have resulted in a reduction in air pollution in the areas they served, (ie: their 'local environment') producing their hydrogen fuel would have still negatively impacted upon the global environment. According to information obtained from oil company BP, when renewably sourced electricity is used to produce the hydrogen emissions of the harmful greenhouse gas CO2 increase by 582 tonnes for every Gwh of power generated. Furthermore, for every 9Gwh of energy invested just 1Gwh of usable power will reach the buses wheel - generating, compressing & storing the hydrogen will waste the rest of the energy. As a contrast trolleybuses are a tried, tested and proven technology successfully used in over 350 towns & cities globally. They are also very fuel efficient - when sourced renewably over 90% of the electricity actually gets usefully through to drive the vehicle. When trialled in Vancouver, Canada they found that one fuel cell bus consumed as much power as a dozen trolleybuses and unlike trolleybuses which can work 24+ hour duties without even needing to be refuelled (OK, so occasionally they do change the bus drivers!) the fuel cell buses needed refuelling after just 4.5 hours - barely half a workday! So for this plus other reasons resulting from their comparative trials they are replaced their old trolleybuses with a fleet of 230 brand new low-floor trolleybuses. Another issue for these fuel cell buses was that they were so heavy that their unladen weight was roughly similar to that of a diesel bus carrying a full complement of passengers. Since governments usually set legal limits on how much a bus may weigh (partly to reduce wear & tear on the road surfaces) the net result was that their passenger capacities were lower than fossil fuel or trolleybuses of comparable size. As with CNG buses, hydrogen buses must be equipped with leak detectors - because hydrogen is extremely volatile. As an aside, the CUTE trial was extended for an additional 13 months from the initial completion date of December 2005, and finished on 12 January 2007. 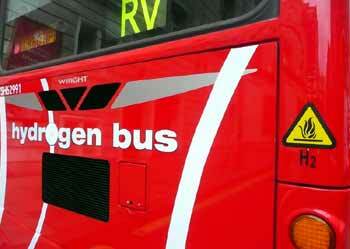 Because of their unique nature once the London hydrogen fuel cell buses had been withdrawn from service they were donated to museums, albeit without their hydrogen equipment - which was reclaimed by the manufacturers for further development works. They have gone to the London Transport Museum, The Science Museum and the Beith Collection in Ayrshire, Scotland. Being modern buses which in no way could be considered to be ‘life - expired‘ it is unfortunate that further use could not have been found for them, perhaps as battery electric or trolleybuses at one of the living museums. One of London's first batch of fuel cell buses, outside Stratford station. Having arrived at the docks the first of Perth, Western Australia's fuel cell buses is unloaded from the ship. Note the pure water vapour (steam) rising from its exhaust pipe. Image: Promotional material issued by the Government of Western Australia Department for Planning and Infrastructure. As part of the HyFLEET:CUTE project June 2009 saw a German bus company unveiling the first of an experimental fleet of fuel cell hybrid buses which use lithium-ion battery packs. They are being seen as successors to the CUTE buses described above and the idea is that a small fleet will be supplied to several towns and cities to evaluate the technology. As with the CUTE buses the 'greeness' of these vehicles largely depends on how their hydrogen fuel is sourced - typically (at present) it comes from fossil fuels and requires so much fuel to be used that when comparing the total energy input these vehicles consume even more energy / result in more air pollution than ordinary diesel buses. All this was proposed under the auspices of TfL and the London Hydrogen Partnership's 'London Hydrogen Transport Programme'. Since TfL had allowed the hydrogen fuelling facility used by the previous fuel cell buses to be decommissioned so the plans had to include building a replacement. In August 2008 a different Mayor (Mr Boris Johnson) who won the Mayoral election earlier in the year decided that as part of a policy of reducing expenditure and not increasing the local taxation levied on the people of London he would scale back his predecessor's plans and deleted the ICE buses. Later he was able to secure EU funding to add an extra 3 fuel cell buses to the scheme, so that the entire fleet would now number eight of these buses. Funding for this hydrogen bus experiment jointly came from Transport for London (TfL), the Department of Energy and Climate Change (DECC) and the European Union via the Clean Hydrogen in Cities (CHIC) project. The first of London's next batch of hydrogen buses, seen on the bus stand outside Tower Gateway Docklands Light Railway station. The elevated view neatly shows that when first delivered the buses sported six roof mounted hydrogen fuel tanks, however since subsequent experience proved that just four tanks were required for the leisurely 18 hour duty cycle these buses perform, so two have been removed. Inside the bus, showing the distinctive red seating fabric which has the words 'Hydrogen Bus' in white emblazoned on the seat back. The rear of the bus, showing the H2 hazard warning logo. 2012 Olympic / Paralympic No-Go! Because the new hydrogen fuelling facility was located very close to the site of the London 2012 Olympic and Paralympic Games it was decided that for security reasons the use of this facility (and by extension, the Hydrogen buses) should be stopped from July to September whilst the Games were underway. A side effect of this was that delivery of the last three buses was delayed until after the games had been completed. are these even a partial solution - or just 'cloak and mirrors'? Some cities have been looking at what are known as hybrid buses as ways to reduce air pollution, improve the attractiveness of their bus services and operate (partially) electric full-size buses without overhead wires. 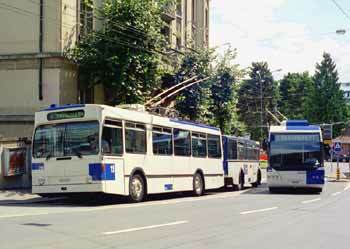 Trials conducted with these buses between 2004 and 2006 have shown that as a general theme they are less polluting and use less fossil fuel than regular (diesel) mechanical buses, and based on this their advocates are trying to hoodwink the public into believing that use them would represent both the best / most advanced way forward which present day technology (in the public domain) can offer - as well as being 'the' solution to bus sourced air pollution. It cannot be reiterated enough that fossil fuel powered (diesel, etc.,) hybrid buses are NOT 'ZEVs' (zero emission vehicles) and that as with ordinary 'mechanical transmission' buses they still pollute their local environments - ie: the streets we use / the air we breathe. 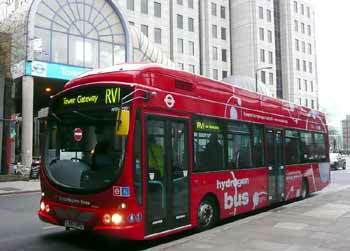 The only buses capable of being true 'ZEVs' are those which are directly connected to the grid power supply system (trolleybuses / roadway powered) and those travel 100% of the time using electric energy stored in batteries / capacitors, with that energy having been received without the use of an onboard fossil fuel engine. 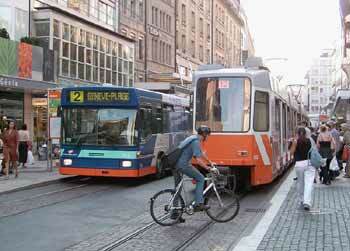 These - along with electric trams, streetcars & light rail - do not give off any tailpipe pollution at all! Because this is a complex topic which also creates a diversion away from the central theme of this page so hybrid buses are more fully explored on their own dedicated page. 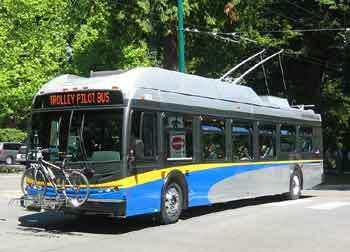 Direct link to the other Electric Buses page. 'Side-Step Congestion' / Bus priority systems / BRT. © Copyright 2001-2016 Simon P Smiler and named image sources.